This week, I announced that I just got the keys to my very first apartment!! My realtor has been amazing (seriously, give Maria a call if you're looking in the East Bay), and as a thank you to her I wanted to make her a little gift, from my new home to hers. My favorite part of this project was definitely the color combo, with the flowers and the stripes and general vintage-y cheerfulness. My least favorite part was probably everything else. I'm an imprecise sewist, and a project like this definitely requires a lot of attention to detail. 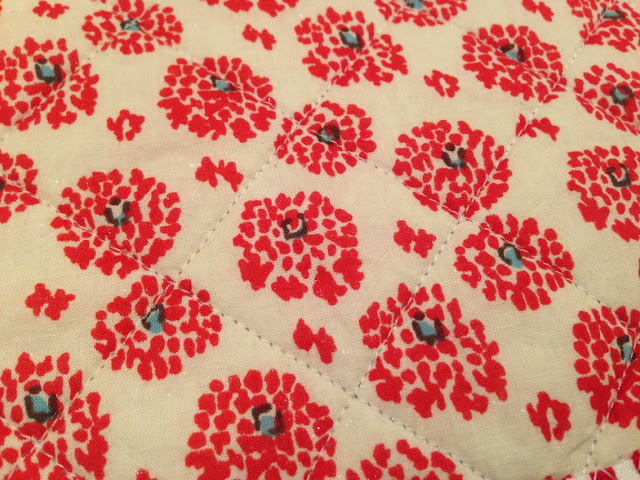 The first sticking point was doing the quilting, which puckered and creased the fabric quite a bit. Switching to my walking foot definitely helped, though, and I can see why the foot is always referred to by quilters. 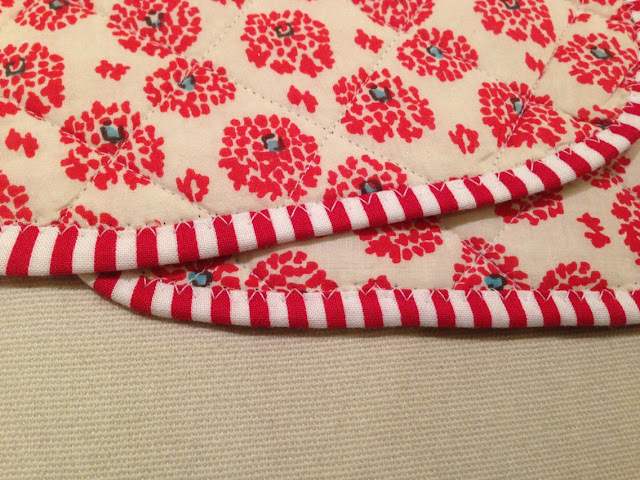 Attaching the bias tape was another challenge, and it's still imperfect in many areas. A zig-zag stitch instead of stitching the ditch helped, and it looks ok if a bit uneven. And let's not even talk about my attempt at embroidery at midnight, which was an utter failure and had to be taken out. So cute, what a nice gift! You are lucky to have such a nice realtor, we're looking in london and it's a jungle out there.. :( Congrats on the new place! They turned out so cute! 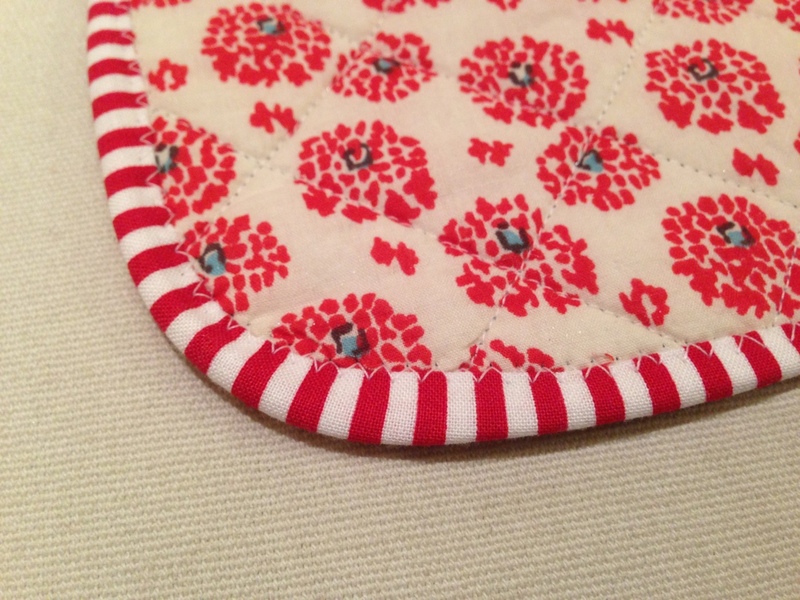 I made a potholder once thinking it would be a fun, quick project. It wasn't. Cute, cute! I love the fabric, too. 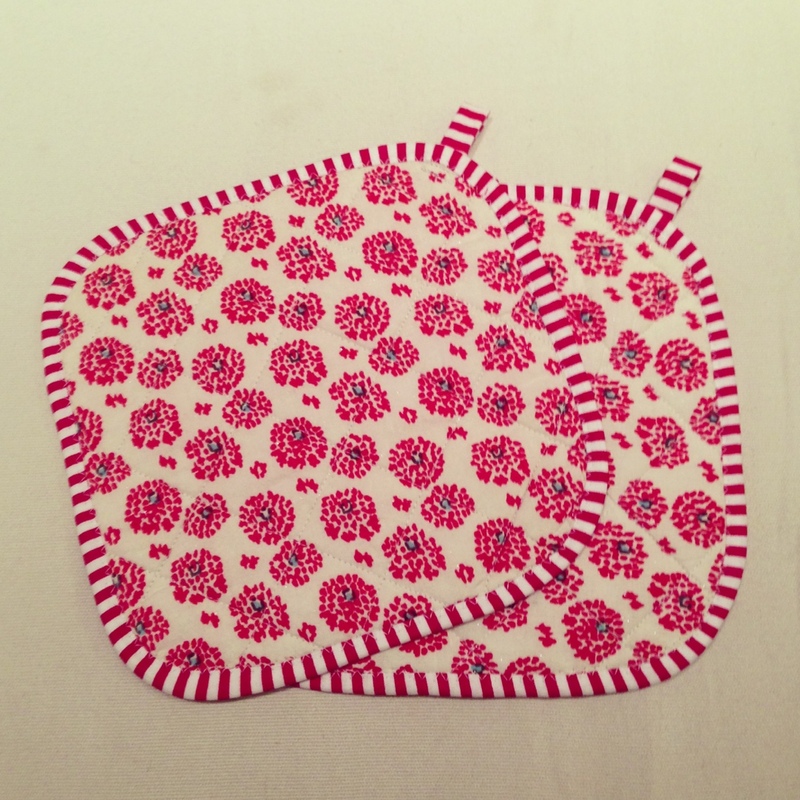 I made my sister some potholders and a mitt YEARS ago. During my visit in February I noticed she still had them and that they were well used! That made me happy. I think they're a great gift. These are very cute! Congrats on your new apartment!